Lusciously creamy and sweet, made with caramelized onion and roasted corn, the latest 99 Cent Chef creation will have you coming back for seconds. This dish is basically homemade creamed corn, but much better-tasting than canned. And you won't get that metallic aftertaste. When roasting corn for a summer patio BBQ, I like to peel back some of the corn husk and drizzle olive oil on the kernels, season with salt and pepper (or Cajun spices), then close up the ear and roast it on the gas grill until done. The husk and corn silk keeps it from drying out, but you still get the smoky grilled flavoring. But for my Roasted Cream Corn recipe, I want a little more caramelization and color. So, first, I peel and boil the corn for 20 minutes, then move it to the grill and toast it on all sides. It's less messy this way -- no smoking husks, and the corn silk doesn't get into everything. And here's a great video link on how to peel corn. I finish up the dish adding caramelized onion, garlic, cream and cheese. 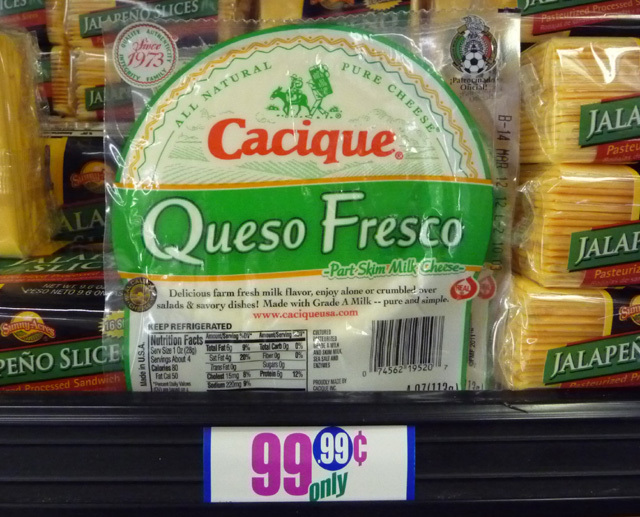 It's rich, but you could lighten it up with 2% milk and a low fat cheese. 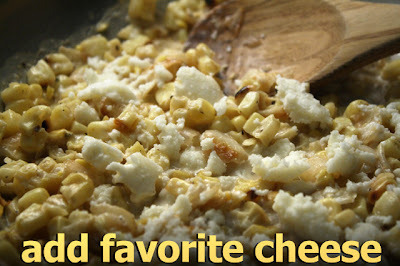 For vegetarian version use soy, almond or favorite dairy substitute. I can always find whole ears of corn for less than a dollar at my neighborhood chain grocery store, or my local Latin market. 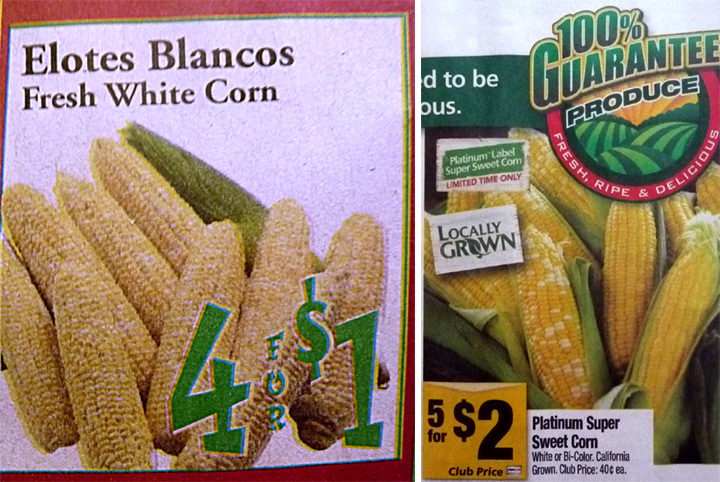 Seasonal fresh corn is also cheaply found in farmers markets and roadside vegetable stands. Depending on the cob size, when you shave off the kernels, a single cob can be the equivalent of a regular size can of corn. It's just as cheap, but fresh and better tasting. 1 large ear of fresh corn - or 2 small ears, peeled and cleaned. 1/2 cup of cream or half and half - okay to use whole or low fat milk. Vegan version use soy, almond or fave diary milk. A slice of your favorite cheese - Mozzarella, Swiss, American, or cheddar. I used a Mexican Queso Fresco. Cheese is optional. 1/2 small onion - white or yellow, chopped. 1 tsp. 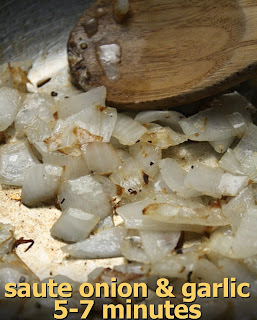 oil for frying onion. 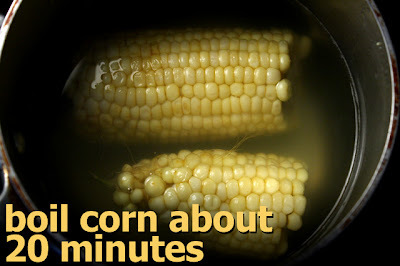 3 cups of water for boiling corn. Bring water to boil in a small to medium pot. Break, or cut, corn in half. Add to boiling water. Bring up to low simmer, and cook for about 20 minutes. While the corn is simmering, add oil to a medium heated pan. Chop and add onion. Cook until lightly brown, about 5 - 7 minutes. Add garlic and cook for another minute, while stirring. When corn is done boiling, remove to a tray. Now it's time to grill or roast the corn. If you have a stove top grill, you can use that - I used my gas BBQ grill. You could also broil corn in the oven. The main thing is to caramelize corn on at least four sides. Cooking time will vary with each roasting method. You want a nice medium brown on as much of each corn cob as possible. 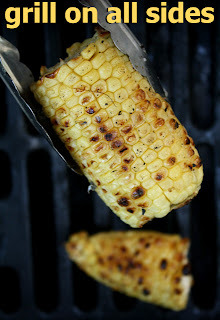 For my gas grill method, I simply add the corn cobs and rotate them about every 5 minutes. Depending on how hot your grill is, it could be quicker. A medium brown is about right. Try not to burn it -- but hey, a little char is fine. After all sides are roasted, it's time to finish it off in the pan with the caramelized onions and garlic. First, remove corn from the cobs. I place the cut, or flat side, of the corn cob on a cutting board or plate. 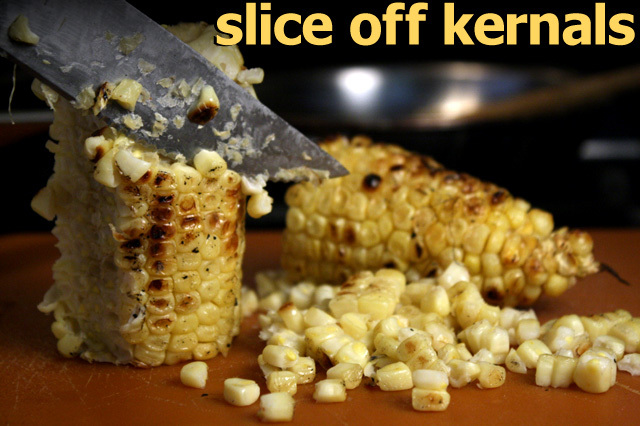 Take your knife and slice down where the kernel meets the cob. Sometimes I slice it perfectly, but then when I rotate the cob to make the next slice, I don't slice deep enough. Oh well -- you have a couple of cobs to get it right! It's better not to cut too deep - you don't want to introduce too much of the tough, mealy cob. Keep rotating and slicing down the cob until all the corn kernels are removed. 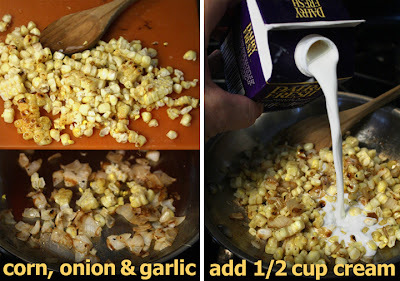 Add the roasted corn kernels to the pan of caramelized onion and garlic. Turn up heat to medium and add 1/2 cup of cream or milk. Bring to a simmer, then reduce heat to low. Salt and pepper to taste, while stirring. Cook about 5 minutes so corn absorbs some of the cream or milk. You want the final consistency similar to canned creamed corn -- or like a thick lumpy gravy. Finally, add a slice of your favorite cheese. I used crumbled Mexican Queso Fresco. The final amount of cheese is up to you. Stir until it melts. Serve it nice and warm. It's easy to double the ingredient amounts, for more family members, or friends. If you want to try this recipe while it's cold or rainy out, you could just go from boiling the corn right to sauteeing it. Hey, you can no longer call it Roasted Creamed Corn, but that's okay with me! roasted corn is awesome. 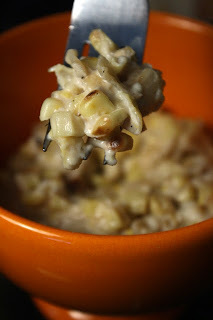 creamed corn is awesome. roasted creamed corn? head exploding. Good gawd does that look good, not for the cholesterol challenged among us but sometimes you just have to run with scissors. Hey Fraz you could run with dull scissors by using lower fat milk & cheese! Boiling corn for 20 minutes is waaaaaaaay too long. A 3-minute boil is all that's required; especially if you are going to grill it as well. Cook it--don't kill it!